Did you remember that Monday is Freebie day at Stripes? Don’t forget to print your coupon for a FREE Lunch Taco good for 8/29 from 11am-2pm. Just be sure to go Like Stripes on Facebook and check out the Shwag Cooler under the ‘It’s Go Time’ tab to print your Freebie coupon. Walgreens Photo has another great freebie photo offer. You can order an 8×10 photo collage print and get it free with coupon code PRINTONE. I love these freebie offers because not only are they great to put up as gifts for various family members but they also give you a great free filler item to help with those Register Rewards. You only have until midnight on Saturday 8/20 to order your free collage but you can pick it up in store at any time after that. Bath and Body Works has put out another great coupon that you can redeem online or print to redeem in store. Just go HERE to find your code or printable coupon. This coupon is good for a FREE Signature Collection item (up to $12.50 value) with a $10 purchase and is valid thru September 6th. Have you tried out the Rainbo Bakery Store on 27th and Lee (see map) ? If not, August is the month to stop by and see what they’re all about. During the entire month of August you can get a FREE Bread Coupon for every $10 spent. I spent $22 today and received 2 coupons! These coupons will be good for the entire month of September and best of all there is no purchase needed to use them (but at prices this low I dare you to only buy just 1 loaf of bread!). The great thing about the Rainbo Bakery is that they have brand name breads for only $.89 a loaf. They also have the Hoagie buns for only $1 (these are usually $2.99 anywhere else), Cinnamon Bread for $1, and brand name hot dog and hamburger buns around $1.39, a price that you can usually only find when it’s on sale in your local grocery stores, and these are their everyday prices. You can always stock up and freeze your bread or stop in any time you’re in the area. When you use your bread coupons in September be sure to nominate a school right on the voucher. The winning school will receive 15% of the sales! My son asked me ‘What if they don’t have a kid in school or know which one to nominate?’, so I told him that I would let you all know that he goes to Chattanooga Elementary if any of you would like the name of a school to nominate. Our thanks to you if you nominate his school and good luck to your school of choice if you have one in mind already! Free Bread and a great donation to a local school? Definitely a winning combination! Go check them out! GameStop is running a fun pizza promotion right now thru August 6th, 2011. If you make a purchase at GameStop or GameStop.com with your PowerUp Rewards Card, you will want to check your receipt for details on how to get a free P’Zone with any PizzaHut.com pizza purchase. So instead of a movie night, let’s make it a game night. I recommend Family Game Night and Wii Party. My kids and I have a blast anytime we play those games! 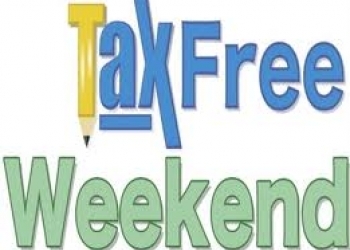 It’s back to school time and what better way to save than on the Tax-Free weekend! Oklahoma’s own Tax Holiday will be this weekend starting at 12:01am early Friday morning (8/5) and will last thru midnight Sunday (8/7). The tax exempt status will qualify for select clothing and shoe items that are under $100. If you have any additional questions about this event check out the Oklahoma Tax Commission website for a great list of answers. UPDATE: Check out Metro Family magazine’s great article for a break down of Rules and Regulations. This way you know what to expect at the registers. There is a $1/2 Bic Stationary Product coupon in your 7/31 SS insert as well as the previous printable and this week this could get you free pens. But what if you find cleared shelves, have enough, or really just want something different. I’ve compiled a list below of the best places to use this coupon. NOTE: This one is for those of you who want a little flair. I’m finding that Staples does take coupons but I’ve never tried so your milage may vary. Or use to price match at Walmart if you can find this item. Take any of the above ads to price match and/or mix and match! Taco Bueno has a Sweet offer good thru 8/6. Just go HERE to print this great coupon offer for a free Cheesecake Chimichanga. The coupon is actually a Facebook wall photo so you don’t even have to print if you have a way to show them the offer from your web enabled phone. Be sure to Like Taco Bueno on Facebook to show your appreciation for this sweet deal. Thanks Nan for this delicious find! I’m sorry for posting this so late but if you still have time for lunch be sure to check out this great freebie offer from Stripes for a Free Lunch Taco good on July 18th only and during lunch 11pm-2pm. Don’t forget to Like Stripes on Facebook so you don’t miss out on next Monday’s Freebie. Just check out the ‘It’s Go Time’ tab to print your coupon. Usually, bowling coupons haven’t been for any locations near us, but here is one that you can use here in the Lawton area! The coupon is good for one Free game of bowling (up to $6) redeemable on August 6th only. This promotion is in honor of World Record Day so you can help America try to beat last years record of most bowling games played in a single day! Best of all, Lawton has 2 participating locations; Holiday Bowl on Cache Rd and Twin Oaks Bowling Center on Ft. Sill. Will you help beat the record? I will repost this the week of the promotion. Sign up for your coupon HERE.